Watch out! 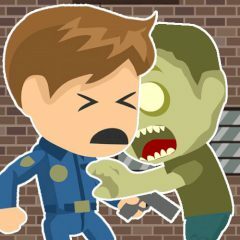 There are so many dangerous zombies, that is why you are the only one, who can help this brave cop and kill them all right now! So, just take your gun and shoot. Explore this strange place in order to clean your city from all these zombies. Something terrible has happened in this city! And this poor cop was only trying to do the right thing and help him to survive in such a cruel place. Now he’s up to his neck in zombies! Are you able to help him to escape? Then do not waste your precious time and you will be the only one who will survive. Just use all the tips and kill all the zombies here. Watch out! They are already here and you must do everything to kill them all. Just throw all the problems away and stay alive at any rate. So, enjoy the game.